Loosen your bow tie, mint your julep, & stop in for a bite to eat. If there is anything better than sprinkles, I’d like to know what it is! Everything tastes better with sprinkles on it, especially cake! 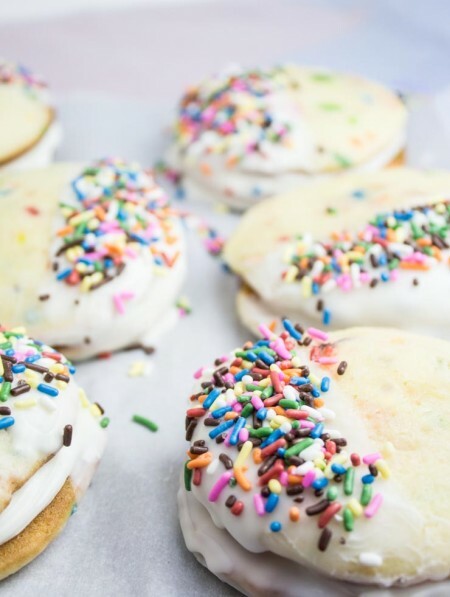 I’m bringing out my inner 3-year old with these Funfetti Whoopie Pies. 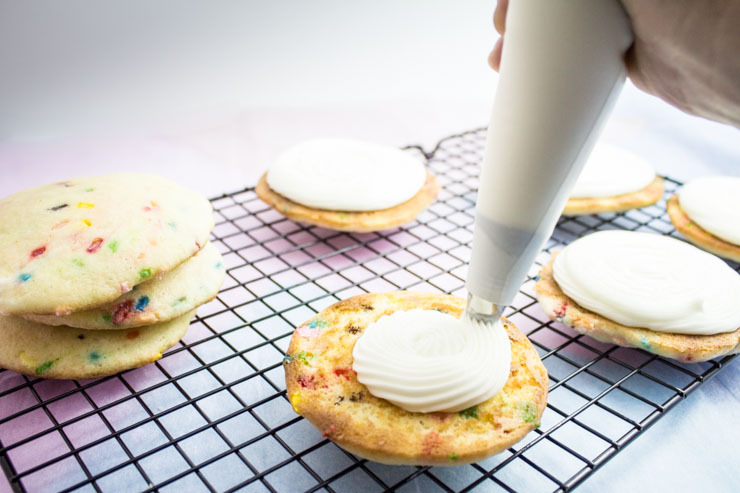 We’ll transform good ol’ Pillsbury Funfetti Cake Mix into perfect hand-held treats. While we are at it, we’ll just go ahead and dip it in white chocolate and add a few more sprinkles. 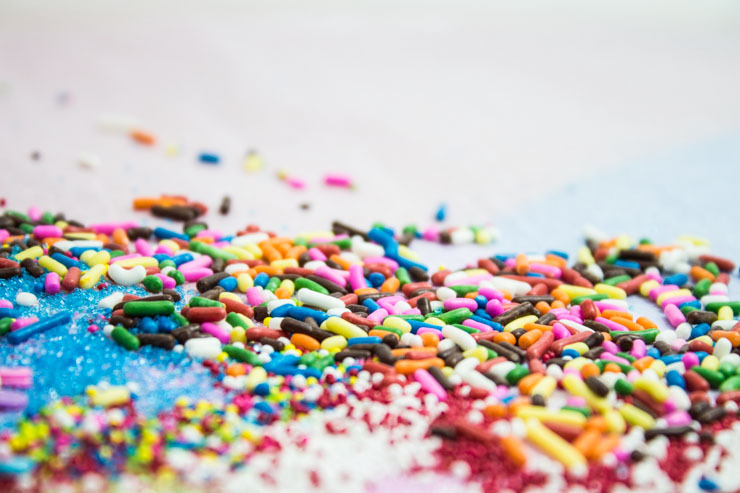 Because, well… sprinkles! With the super-popular Pillsbury Bake-Off contest coming to our very own Nashville this year on November 3rd at the brand new Omni Nashville Hotel, I thought I would transform something into my own special treat. Hopefully lots of you sent in some great recipe ideas. Hoping even more that we will see you in the finals here in Nashville! 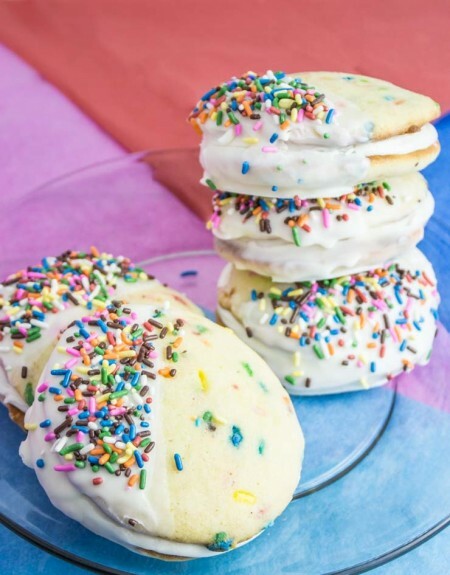 There really isn’t anyone that doesn’t immediately recognize this fun-filled Funfetti baking mix and start to remember the sweet treats of their childhood. Nobody I would want to know, at least ;). This stuff just screams happiness. You could go ahead and be all fancy and make your own sprinkle-infused cake mix, but ehhh. I just wanted something quick and easy. I always seem to have a box or ten of this stuff sitting in the cabinet anyway. Aside from having enough cake mix to induce a diabetic coma, I seem to have become a hoarder. Call the shows, book the intervention. SPRINKLES! I have soooo many sprinkles. I don’t really think this is a problem (they never do though, right?…). Evident by being this recipe’s main attraction, it’s a good thing I did have 14 different types just waiting to be used. Pick out your favorite(s). I went with the larger rod shaped sprinkles to accent these whoopie pies. The sugar crystals add nice color and pizazz, but tend to bleed over into the chocolate when left for a while. Ya… I said it. Chocolate. 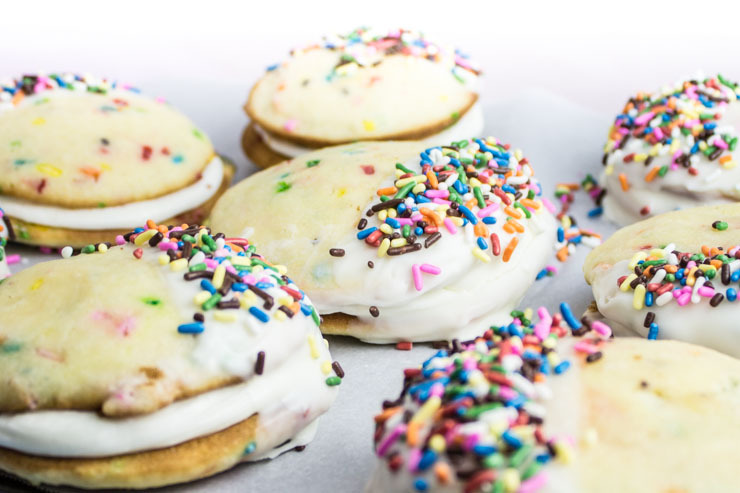 Why not take the entire cream-filled whoopie pie and dip it in white chocolate coating and then cover it with sprinkles? That’s what you are suppose to do, I think. For the white chocolate coating, I am going to use a shortening/candy coating chocolate mix that I took from my very first recipe post, Christmas Tree Snack Cakes. I’ve used this coating recipe for tons of treats. Always a winner. I ended up with a dozen of these colorful treats. The next time I make them, I will probably try them as mini-whoopie pies. Maybe even macaron sized. They are very sweet. Not that I am complaining. I eat… I mean, I would eat sugar in a bowl if people wouldn’t judge me. We ended up halving these and still had plenty of a su su su su suuugar rush. It’s always great to take a simple off-the-shelves item and make it something of your own. I would love to hear what creations you all have concocted. Don’t forget to check out the delicious recipes from past Contest finalists at the Bake-Off website! Pillsbury, Pillsbury Funfetti and Pillsbury Bake-Off Contest are property of General Mills, Inc.
4 oz cream cheese, room temp. 4 ounces butter, unsalted - room temp. 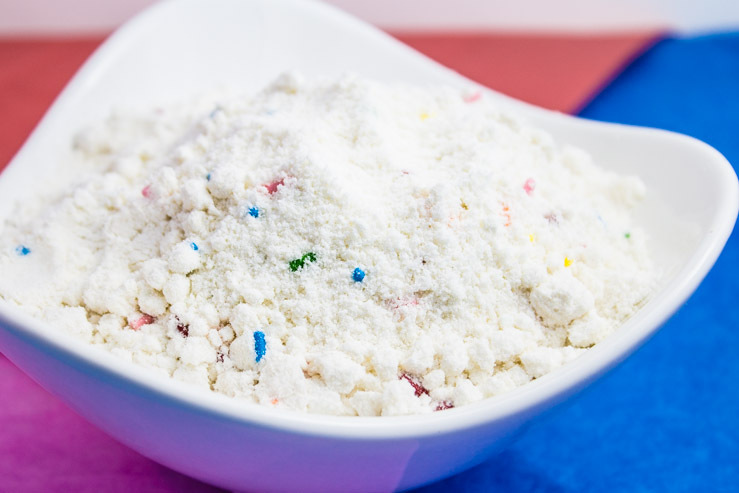 Mix Funfetti Cake Mix with water, eggs, vegetable oil in mixer until well combined. On parchment lined baking sheet, place two tablespoons of batter in circle, about 1½ inches in diameter. Bake for 8-10 minutes (9 minutes was the magic number for me) until the bottom edges are barely browning. Remove and cool on pan/paper before transferring to cooling rack. In mixer, combine cream cheese, butter and vanilla until combined. Slowly add powdered sugar and stir on slow speed until combined. Mix on medium speed for a minute. Pipe cream onto bottom of one cake and place second on as top (don't overfill). Dip whoopie pies in coating and place on parchment-lined cookie sheet. On the last coat, immediately sprinkle with sprinkles. Cool and enjoy! Stores well in container for several days in refrigerator. Server at room temp. for best taste. Visit SouthernFATTY.com and let us know how you enjoyed them! Did any of you submit recipes into the Pillsbury Bake-Off Contest for this year? Will I see you here in Nashville? Comment below! These look so wonderful. I think I may give them a try for the holidays this year! My husband’s birthday is coming up, and he is a sugar addict too. These look like the perfect birthday confection. It is my dream to win a Pilsbury bake off, but I have only entered once. Every time I think I come up with something original, I look online, and its already been done. Alas, a girl can dream. It’s definitely tough come up with an original recipe today. Especially when there’s thousands fighting for it. A competition like that would be tons of fun to be part of the finals for, though! Let me know how they go over if you make ’em! 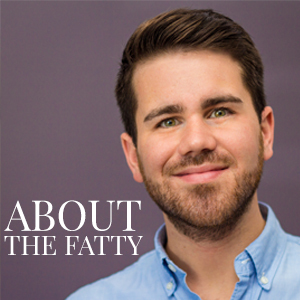 Southern FATTY is a Nashville, TN based food blog with everything delicious.